IIn this talk we will discuss how to draw 360-degree panoramas by hand and how to display them interactively as VR panoramas; further, we use this practical task as a leader to discuss what is, after all, a perspective – as an object of art and as a geometrical entity. We propose a definition that puts an ancient concept – anamor- phosis – at the center of the study of perspective, both classical and spherical. Spherical perspectives are drawings on a plane that capture all the visual informa- tion that your eye can get by rotating freely around a fixed point. They relate in interesting ways to both anamorphosis and cartography. Recent advances by the present author have made spherical perspectives no longer the exclusive of com- puter renderings but another kind of visual tool that can be drawn by the human eye and hand just like classical perspective. 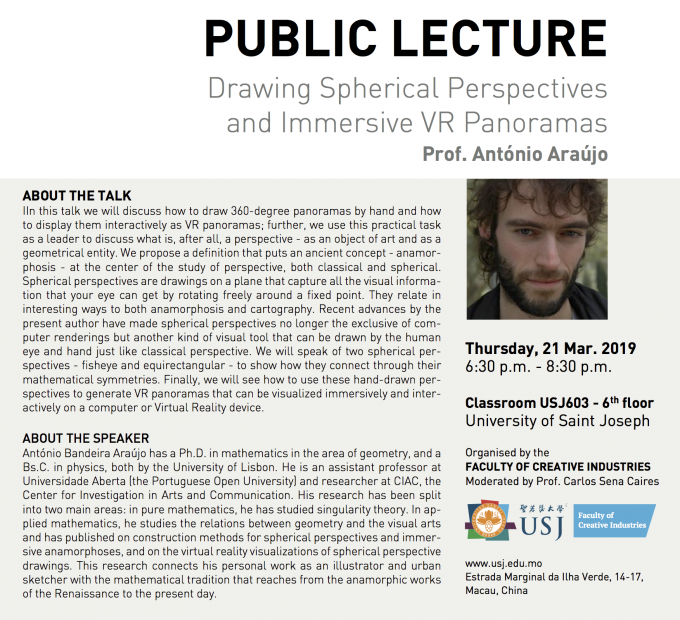 We will speak of two spherical per- spectives – fisheye and equirectangular – to show how they connect through their mathematical symmetries. Finally, we will see how to use these hand-drawn per- spectives to generate VR panoramas that can be visualized immersively and inter- actively on a computer or Virtual Reality device. António Bandeira Araújo has a Ph.D. in mathematics in the area of geometry, and a Bs.C. in physics, both by the University of Lisbon. He is an assistant professor at Universidade Aberta (the Portuguese Open University) and researcher at CIAC, the Center for Investigation in Arts and Communication. His research has been split into two main areas: in pure mathematics, he has studied singularity theory. In ap- plied mathematics, he studies the relations between geometry and the visual arts and has published on construction methods for spherical perspectives and immer- sive anamorphoses, and on the virtual reality visualizations of spherical perspective drawings. This research connects his personal work as an illustrator and urban sketcher with the mathematical tradition that reaches from the anamorphic works of the Renaissance to the present day.